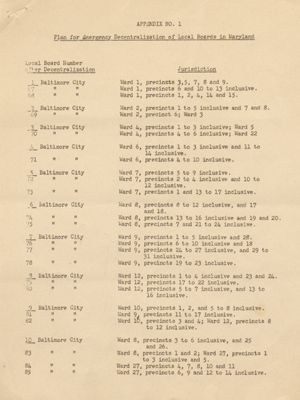 The document shows a 1968 emergency plan for decentralization of local draft boards of the Selective Service System in Maryland, including an internal communication note. 1 Baltimore City                           Ward 1, precincts 3,5, 7, 8 and 9. 67     "        "                             Ward 1, precincts 6 and 10 to 13 inclusive. 68     "        "                             Ward 1, precincts 1,2,4, 14 and 15. 2 Baltimore City                           Ward 2, precincts 1 to 5 inclusive and 7 and 8. 71     "        "                             Ward 6, precincts 4 to 10 inclusive. 5 Baltimore City                           Ward 7, precincts 5 to 9 inclusive. 73     "        "                             Ward 7, precincts 1 and 13 to 17 inclusive. 74     "        "                             Ward 8, precincts 13 to 16 inclusive and 19 and 20. 75     "        "                             Ward 8, precincts 7 and 21 to 24 inclusive. 7 Baltimore City                           Ward 9, precincts 1 to 5 inclusive and 28. 78     "        "                              Ward 9, precincts 19 to 23 inclusive. 8 Baltimore City                           Ward 12, precincts 1 to 4 inclusive and 23 and 24. 79     "        "                             Ward 12, precincts 17 to 22 inclusive. 9 Baltimore City                           Ward 10, precincts 1, 2, and 5 to 8 inclusive. 81     "        "                             Ward 9, precincts 11 to 17 inclusive. to 3 inculsive and 5. 85     "        "                             Ward 27, precincts 6, 9, and 12 to 14 inclusive.